My dad retired young and has seen his fair share of hobbies. He grew up in downtown Toronto so he’s mostly followed outdoorsy pursuits like farming and gardening, but being a staunch resistor of all things vegetable, he doesn’t actually eat anything that he grows! 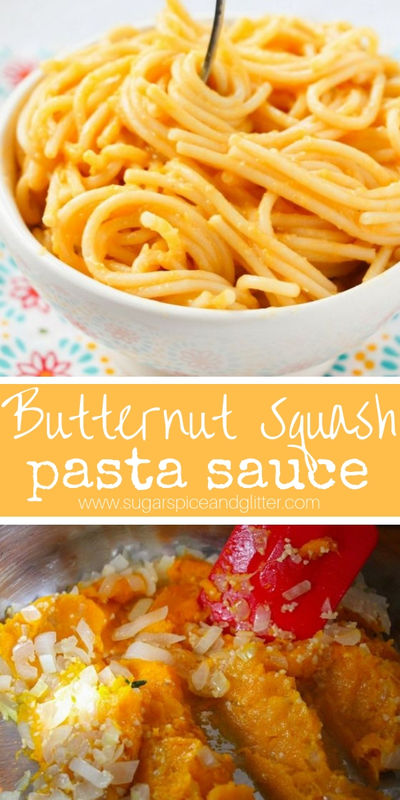 Last year he had crazy success with growing squashes – butternut squashes and spaghetti squashes, specifically – which means that my kitchen saw an influx of squashes like it had never experienced before! 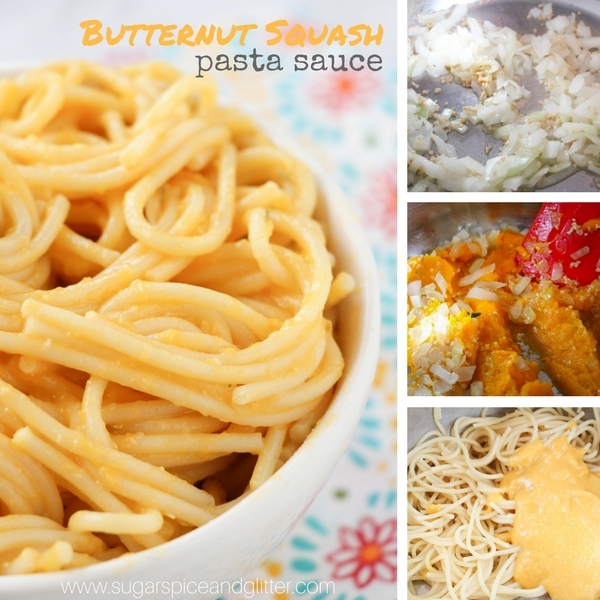 We were able to experiment quite a bit (especially since we weren’t shelling out for the squashes) and this butternut squash pasta sauce was one of our most successful experiments! 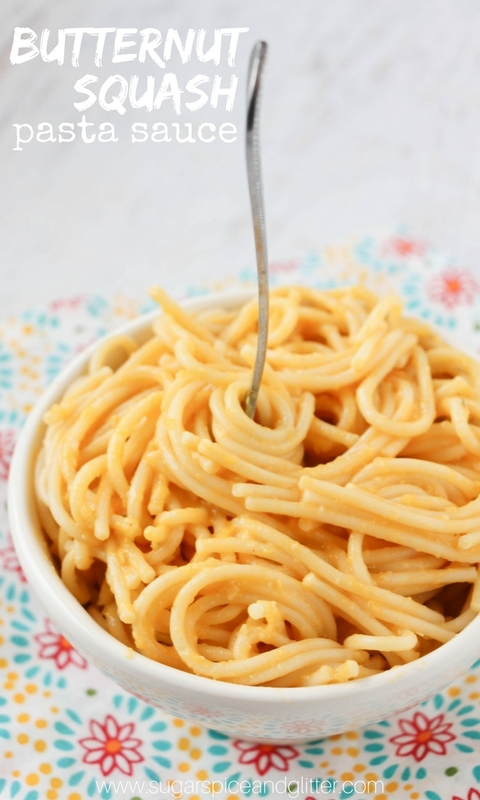 A dairy-free, super creamy and rich sauce with that delicious nutty, sweet yet earthy flavor of butternut squash balanced out with sautéed sweet onions and garlic. 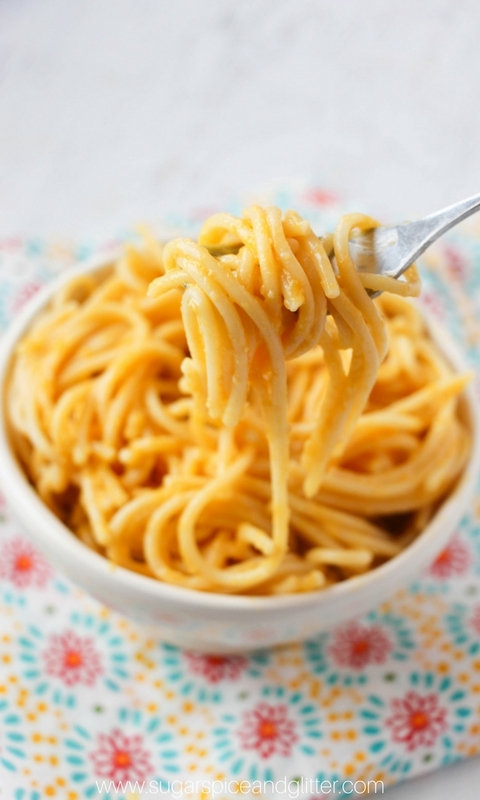 Typically, squash is served soft – whether mashed or in a soup – so to enjoy it as a smooth and creamy sauce with perfectly cooked pasta is a real treat and perfect for picky eaters. 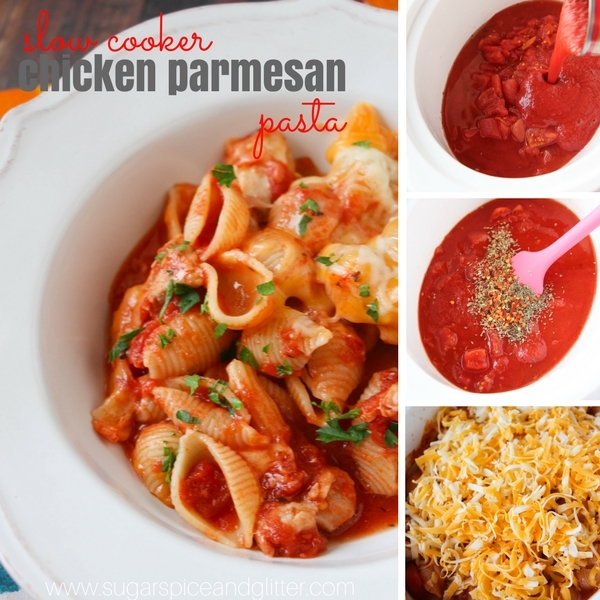 (They don’t even have to know that it’s a vegetable sauce!) 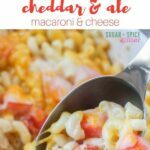 We also made another version of this squash pasta sauce for our Butternut Mac & Cheese which was just as unexpectedly delicious! 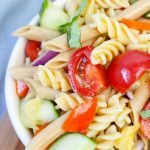 What’s especially awesome about this recipe (and recipes like it) is that it doesn’t feel like you’re having vegetables at all, so you can top it with even more vegetables or serve a side salad without it feeling like overkill. 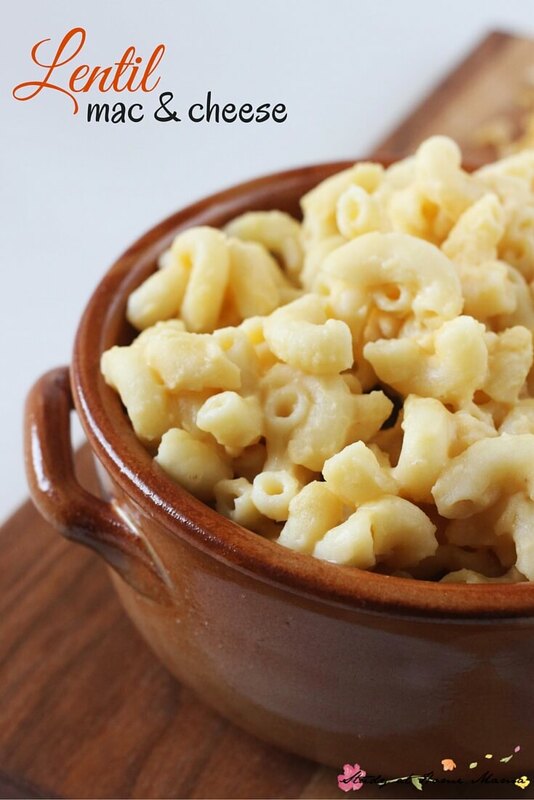 (Or just rest assured that your picky eater finally had a vegetable!) 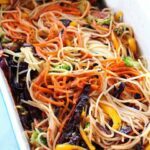 It’s an easy way to sneak extra vegetable servings into your day. Butternut squash is a great source of fibre, potassium and vitamin b6 – helping build strong bones, supporting the nervous and immune systems, and also great for heart and digestive health. 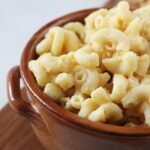 Tip: you can use leftover squash for this recipe, and you can freeze whatever squash you don’t use for future recipes. 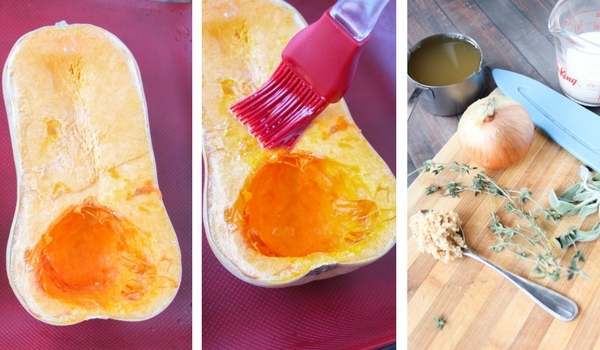 Cut the butternut squash in half and brush 2 tablespoons of olive oil over the flesh part (not the skin). Roast the butternut squash for 25-40 minutes, until slightly browned and an inserted skewer goes through the squash with little effort. Scoop the butternut squash out of the skin and place in a large bowl. Heat the remaining olive oil in a large stockpot over medium heat. Add the garlic, onion and herbs. Sautee until the onion is translucent, then add 1 1/2 cups of the squash and stir well. Thin the solution out with broth and allow it to come to a boil. 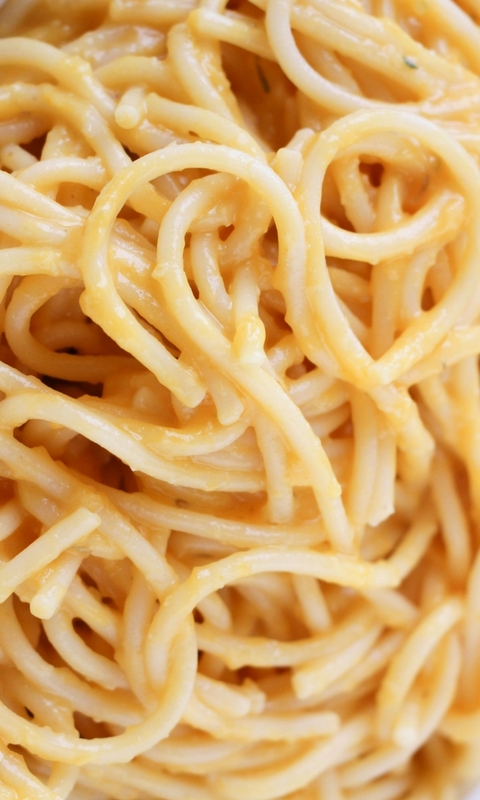 Meanwhile, cook the spaghetti according to package directions. Use an immersion blender to puree the butternut squash mixture. 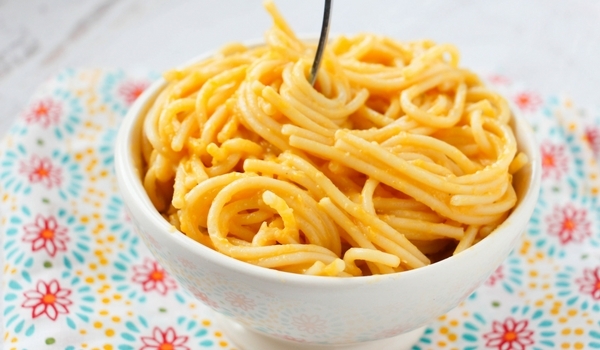 Stir in the cooked & drained spaghetti and stir to coat with the butternut squash sauce. 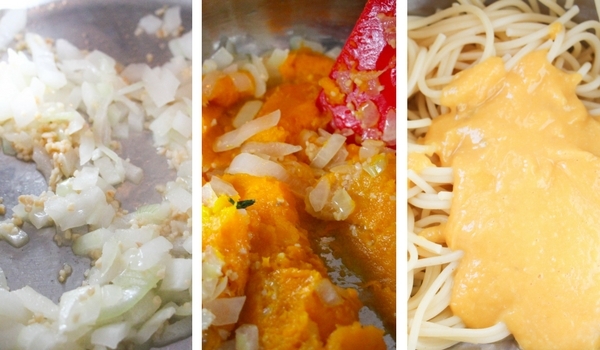 This delicious, dairy-free vegetable pasta sauce is a great way to enjoy butternut squash, and an inventive way to mix things up if you have serious pasta lovers at home.